Aggregate real GDP growth in CESEE is at its strongest level for six years, and in 2017 all economies in the region expanded for the first time in a decade. External conditions are highly supportive of growth in CESEE. All the big engines of the global economy – the US, China and the eurozone – are expanding strongly together for the first time since 2010. 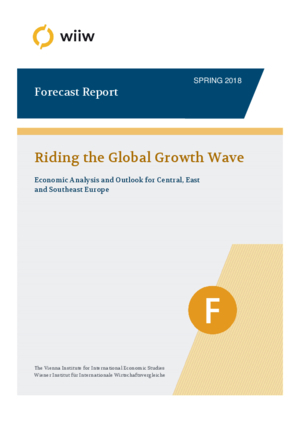 The coordinated global upswing has further to run, and we expect CESEE economies to continue to benefit in the coming years. EU-CEE and Turkey will grow strongly during our forecast period, while activity in the Western Balkans will pick up from recent years. The CIS and Ukraine will remain the regional laggards, but will continue to recover slowly. We do not think that any economy in the region is ‘overheating’, although there are growing risks in Romania and Turkey. We expect inflation to remain very subdued in most of CESEE during the forecast period. In parts of CESEE, large-scale Ukrainian migration is helping to relieve labour market tightness. Wage increases in most of CESEE have been strong, but are concentrated largely in the manufacturing sector, and have been more than offset by rising labour productivity and non-price competitiveness. External competitiveness is not in danger. Across the region, investment will rise faster than headline real GDP growth in 2018-2020, driven by low interest rates, high capacity utilisation, stronger confidence, EU funds and still low base effects. Most countries have seen their export/GDP shares rise in the past decade, which increases their ability to take advantage of the current upswing. Many are moving up the value chain. Banking sectors in CESEE are generally on a much stronger footing than a few years ago. However, the old pre-crisis, highly leveraged model reliant on foreign inflows is mostly a thing of the past, meaning that credit growth will be relatively low by historical standards in the coming years. Downside risks to regional growth emanating from local and global factors are significant. In particular, we are worried about a trade war, the exit of major central banks from extraordinarily loose monetary policy, pockets of high corporate and government leverage, east/west EU splits, the undermining of institutional independence in some countries, geopolitical tensions, the Ukraine crisis, and potential spill-overs from a renewed outbreak of volatility in the eurozone, or a Chinese debt crisis. Convergence with Western European income levels will proceed in the long term. However, there is a risk that specialisation in parts of the supply chain where little value is created will condemn the region to a permanent ‘semi-periphery trap’.